Publishing your results is important for several reasons. First, it is a crucial step in the scientific process. The growth of knowledge can only happen if people communicate what they've found out to one another. Giving talks and going to conferences helps, but the published paper gives people a chance to really take in what you have to report. As Bob Jaeger (long-time editor of Herpetologica) once remarked, "if you don't report the results of your research, you're essentially a hobbyist". Herpetology as a hobby is great, but you don't need to be a student or employed as a scientist to do it. Science is essentially a dialogue conducted among people with a shared interest. By publishing your results you'll be taking part in the big human discussion on how nature works! Like it or not, the published paper is the "coin of the realm" in scienceland. Why is this so? Well, our society is fortunately affluent enough to employ people to actually go out and study nature for a living. However, universities and government agencies are not that affluent, which means that only a minority of people trained to do biology will find gainful employment doing biology. Employers naturally want the most for their research dollars, so this means hiring people who are not only cluey about biology, but who also see projects through to completion. In other words, the published paper is the "knowledge product" that demonstrates to people that you've found something out about nature (see the above!). Writing up your results is really the easiest part of the whole endeavour! You've already done the hard work ­ wringing your hands in the planning phase, chasing down all the supplies (including hard-to-catch herps), fighting fires as the project rolled along, hammering all the data into the computer, suffered through the statistics and graphics programsyou get the idea. Now all you need to do is tell people about what you've found. Writing won't be easy at first, but it does get easier and easier with practice (just like anything technical skill). Plus ­ like it or not (again) ­ a research scientist can plan on a life of writing. If it's not a manuscript, it will be grants, reviews, reports, etc. So the bottom line is that you may as well jump into the writing game sooner rather than later. There is one important thing to have before you start writing up ­ knowing the literature in your field. Hopefully, you will only need brushing up from your literature search you did before starting your project. Again, science is a dialogue among people, so it's a good idea (and downright courteous) to know what other people have said before opening your mouth! These days Endnote, Current Contents and the Web of Science can all help you to find what's out there and organise your references. Your local librarian will be more than happy to get you started looking for stuff online. The paragraph is the "unit of composition" for good reason ­ it provides the reader with blobs of information in discrete, easy-to-digest packages. A good paragraph will have a clear first (or "topic") sentence. You can write out rough topic sentences for each paragraph from the points you want to talk about. Then you can begin to move these sentences around and then finally flesh them out as full-length proper paragraphs later when you really begin to get into the writing. Your outline can ultimately become the manuscript you submit to the journal. The key is to keep writing and revising, writing and revising, writing and revising! 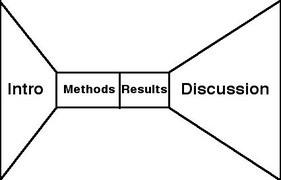 One way to envision a research report is as two funnels connected by a tube. The funnel bits represent your Introduction (from general to particular) and Discussion (from your results to the bigger picture). The tube represents your Methods and Results as there is less scope for wandering from the straight path of getting the information across as clearly as possible. There's lots of ways this funnel doesn't hold up (in reality the funnels would really be quite lumpy and bulgy on the sides), but it's not a bad way to see the structure of your paper when getting started. Although the Methods come after the Introduction, this is a good place to start writing your manuscript. Because you've already done what you've done, in principle you just need to get what you did out onto the page, then rearrange it so that it makes sense. Getting the Methods down first gets you started right away, as opposed to banging your head on the first grandiose sentence of the Introduction (see below). Dividing the Methods up into sub-sections is a good idea. Some popular ones are: Subjects, Natural History (more common these days), Experimental Design or Sampling Techniques andAnalyses. Just divvy it up naturally! Something to keep in mind is that you only want to include the methods that were used to get the data you report in the results. For example, if when you caught your lizards you counted mite densities in addition to size, mass, etc., and you're only reporting on the size and mass, then leave out the mite counting bit. You can report those methods in the mite paper. The Results section is usually the shortest section. However, it is important to be very clear when presenting your results as the reader is hanging out for the answers of the questions you set-up in the Introduction. It is a good idea to put much care into thinking about how you'll present your data visually. In general, let the pictures tell the story! Humans are visual creatures, so having your main results in a figure will help your reader follow what happened in your study. Tables are good for including large amounts of information that the reader can have for completeness, but you should not put your juiciest bits of data there. Some notes on making your figures. When possible, try to have scatterplots or frequency histograms of the data so that the reader will get a real feel for the data (including the noise!). This can be useful for later researchers who can analyse your data a different way for different reasons. With complex data sets, however, bar graphs should be fine as you don't want to overwhelm your reader with too many data points at once. Another tip is to not rely too heavily on figure-making programs. If you start with a blank bit of paper and begin to sketch out what you're trying to get across, you can often come up with a better way to present the data visually. You're also likely to get less arbitrary features in your figures that come from the default settings of a figure-making program. Try it! When you're describing the results in words, the text should describe the patterns in the data ­ not the statistics. For example, a bad example might be: "Clutch size differed significantly as a function of feeding regime." A better way to say this might be: "Females with higher resource availability produced larger clutches of eggs than females with access to fewer resources." The Discussion section can be envisioned as the "inverse funnel" depicted above in the diagram. Here the general idea is to start specific with the results of your study, and then to begin to relate the new information you've discovered to what other people have found. Finally, you'll want to relate what all this means to the "big picture." There is much variation in how the Discussion section can be written. Below are some general principles, but the main thing to remember is to play around with the structure so that in the end your Discussion is a satisfying read (always bear your long-suffering reader in mind!). The first paragraph can serve as a mini-abstract for the Discussion section. Here you can restate the main question, your findings, an indication of the conclusion you're going to draw and an outline of what's to follow in the Discussion section. It's important to have a fresh angle at this point, and not merely a repetition of the Abstract. It's usually a good idea to cover the particulars of your study in the second section. All studies have arbitrary features in them (and sometimes bits that went wrong), and these are best dealt with early in your discussion of the patterns in your data. After you go over the basics of your results, the reader will want your interpretation of all these patterns. Basically, "what happened?" You can first discuss the results of your own study, then start relating them to what others have found in similar studies ­ the widening of the inverse funnel! Ultimately, the reader will want to know what the heck you think is going on. This is your time to say what you really think is going on, and so this bit is important (ooh ­ pressure!). One way to proceed is to make your strongest claim, then to back it up with (i) evidence (from your study and others) and (ii) a clear logical argument. Too easy, right? The key to writing this section is basically to use your guts and have fun. You've worked hard for months on this project, so your understanding of it that lies in the marrow of your bones needs to come out here. After all, you're in the best position to call it as you see it at this point. By marshalling your evidence and arguments in writing this section you can really sharpen your own understanding too. Don't worry about "gaps" in your preferred scenario ­ just make these an interesting part of your story. Finally, you may want to have a "future directions"-type section at the end. This is often a good idea, but remember to keep your suggestions brief and realistic (rampant speculation is cheap). It can be a good idea to write your Introduction last. Although this sounds odd, doing this can help you to set-up the rest of the paper best because you know where it's going. Plus, you'll already be warmed-up writing-wise, and have lots of "big picture" ideas to get down. And you don't have to face that first sentence right away (for instance, the way Snoopy never gets past "It was a dark and stormy night" in his would-be novel). You will probably have some sort of an outline based on a proposal of sorts, and this will be useful to begin with. However, don't be shy about deleting the whole thing and starting from scratch (this won't be a scary thing because you like writing now, right?!). The funnel analogy is particularly apt in the Introduction section. Here you want to introduce your reader to the general issue gently. Your opening paragraph should be written plainly. You can get into the details gradually by narrowing down the question that your study will help to answer. When you eventually introduce your study animal and system (i.e., not in the first paragraph! ), the reader will want to know what special insights your system can yield that will help illuminate the main question. What you're trying to do here is to generate a "search image" in the reader's mind for certain kinds of results that will either corroborate or reject the hypotheses. So you'll have to sort out what information is relevant towards this general aim within the larger area that you're working in (with all its multifarious diffuse non-existent borders). Citing recent controversial papers will indicate to the reader that you're up on the issues (and so you will be, having read all those recent controversial papers). What follows is a list of miscellaneous tips that you may want to try out. - Tape (or pin) your main result figures above your desk. ­ Doing this provides a constant reminder of the fruits of your research that you're trying to get across to the reader as you write. - Follow a good recent paper as a guide. ­ Those recent controversial papers can serve to inspire you intellectually, but they are probably also effective for stylistic reasons too. Feel free to imitate their style as a starting point, knowing that your manuscript will invariably deviate from theirs owing to the particulars of your study and your personal style of writing. - Use short sentences! ­ People like Stephen J. Gould or Rick Shine have an amazing ability to roll off long ambitious sentences that always seem to land on their feet. Although you might be able to do this eventually, it is best to start out writing shorter sentences that are less likely to get tangled up and land on their bums. But don't overdo it or else you'll end up sounding like a telegram or a text message on a mobile. - Print out a hard copy, forget about it, then read it critically. ­ After working on a manuscript for while you will eventually begin to lose the forest for the trees. At this stage, your time is probably best spent getting away from your manuscript and dealing with some other things in the meantime. When you think you've reached this point, print out a hard copy and forget about it for a while. Then when it's time to get back into it, take your hard copy somewhere without distractions (e.g., library, park bench) and read it afresh, pen in hand. - Let your labmates read it over. ­ Your labmates can be a valuable source of feedback, even if they're pursuing different kinds of projects. Because you bump into them frequently, it's easy to talk about what they did or didn't like in the paper after they've read it. Plus, this can lead to a reciprocal deal which means that you can return the favour later and benefit from providing critical comments on their drafts. - Submit the manuscript! ­ A perfectionist streak is a good thing in a scientist. However, perfectionism at the submission stage can be a real liability. If your manuscript is eventually accepted, there will almost always be revisions to be made. So don't try to submit the perfect manuscript ­ after a period of diminishing improvements, put the thing in the mail and start on the next one! Scientific writing is merely a way to tell people what you discovered. The trick is that you really need to put yourself in the mind of the reader to get your message across. By doing simple things such as printing out a copy and coming back to it fresh you will know intuitively what pieces of information are necessary for your reader to put it all together. I've learned heaps from the references below, and have drawn on them heavily to prepare the advice above. All are good, but may require some time to digest. If you stumble on a case of writer's block, perusal of these references may provide some crucial bit of advice and an impetus to start hammering the keyboard again. Booth, W. C., G. G. Colomb, and J. M. Williams. 1995. The craft of research. Univ. Chicago Press. Strunk, W., and E. B. White. 1999. Elements of style, 4th ed. Macmillan, NY. Herpetologica. 1998. Points of view on contemporary education in herpetology. 54:June supplement.